A special screening is taking place at Middlesex University to mark the 70th anniversary of the liberation of the Bergen-Belsen concentration camp. 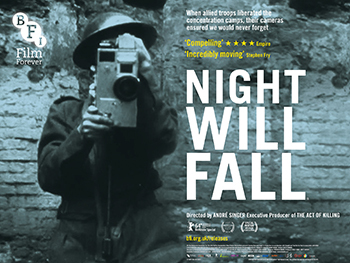 The documentary 'Night Will Fall', which features original raw footage recorded by army and newsreel cameramen, will be shown on 15 April, exactly 70 years after British troops entered Bergen-Belsen in Nazi Germany. Following the screening, there will be a panel discussion with the film's Oscar-nominated director André Singer, 92-year-old survivor Gena Turgel, known as the 'Bride of Belsen' after she married one of the troops who liberated the camp, and local Hendon resident Bernd Koschland, who was eight when he came to Britain on the Kindertransport rescue mission. They will be joined by Middlesex's Professor of International Politics Brad Blitz and Professor of Journalism Kurt Barling. Commenting on the event, Professor Blitz, Deputy Dean of the School of Law, said: "The screening will give viewers an insight into what the Allied forces were faced with and the harrowing sights they came upon when they liberated the camps this time 70 years ago. "Middlesex is honoured to host the film and having the film's director alongside survivors will give the audience an opportunity to learn about the terrible atrocities that took place and the crimes perpetuated by the Nazis." In January, Middlesex hosted Barnet's Holocaust Memorial Day, which was attended by the Mayor of Barnet Councillor Hugh Rayner and hundreds of members of the local community. "Barnet prides itself in being a diverse borough and has one of the largest assemblage of Jews outside Israel and the US," Professor Blitz added. "We are proud to be hosting such a thought-provoking evening which we hope will enlighten a wider audience on the truly appalling conditions Jewish people were faced with all those years ago." For more information on the screening and to book your place, visit the event listing.